On Friday 22 and Saturday 23 February history was made in Epsom. 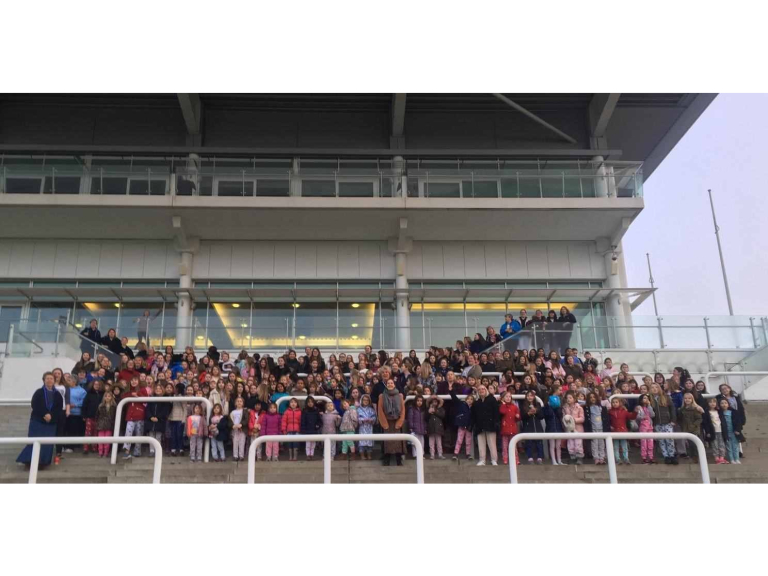 Nearly 300 Rainbows, Brownies and Guides and their leaders from Girlguiding Epsom Division held a sleepover at Epsom Downs Racecourse. This landmark event was to celebrate World Thinking Day. 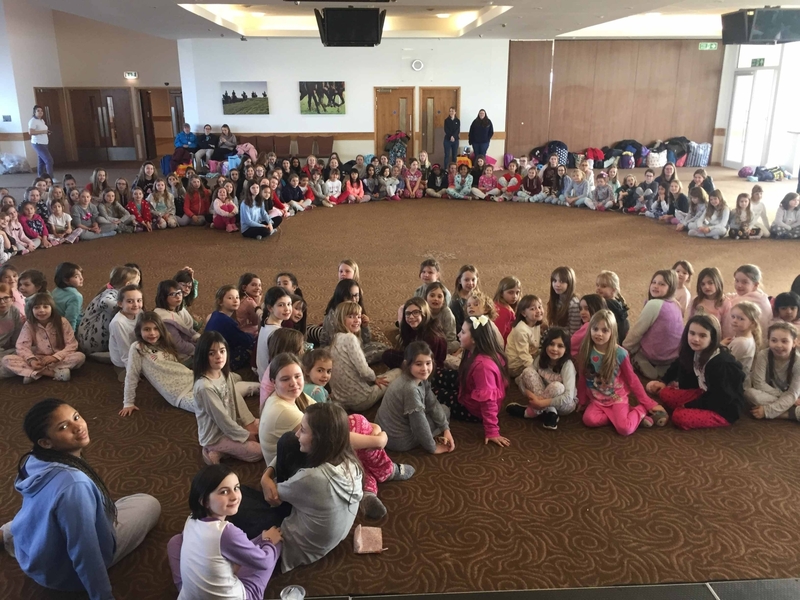 Every year since 1926, on 22 February everyone who is part of the World Association of Girl Guides and Girl Scouts (WAGGGS) celebrates international friendship across 150 countries involving 10 million girls. 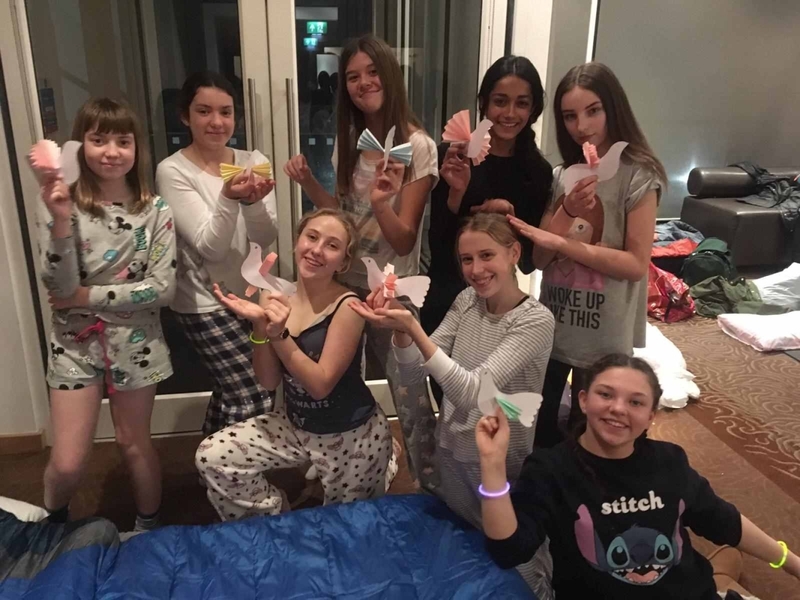 Epsom Division Commissioner Mary Zoeller said: “We were delighted when Epsom Racecourse agreed to let us use the Duchess Stand for our Division sleepover and give these girls a unique experience to celebrate Thinking Day in an unusual and memorable way! “The event was opened by the Mayor and Mayoress of Epsom and Ewell Councillor and Mrs Dallen and the Rainbows, Brownies and Guides enjoyed a whole range of activities including a glow stick campfire, line dancing, remaking the Girlguiding promise and getting up early on Saturday morning to watch the sun rise and see the racehorses out on the Downs. We created a massive trefoil shape with coins and the money from this has been donated to WAGGGS Thinking Day charity. We also created a fingerprint tree which will be displayed in our new Lodge at Horton Country Park which we are currently fundraising to complete.